Architect-designed home, overlooking the Wailuku River. Every space is filled with interesting angles, views and light...and STUNNING views of the river. Enjoy the incredible view from the spacious deck and watch the different moods of the river and the rain forest surrounding you. This home is incredibly private and exceptionally designed for comfort and style, all in one. The master suite is separated on one end of the home featuring a large office and resting area, and a spacious, master bathroom suite, complete with walk-in shower, and Japanese Furo bath room, both overlooking the river. 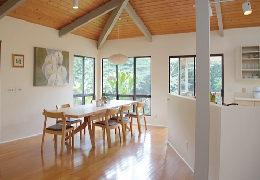 The living room is very spacious with soaring, exposed beam ceilings and open to the kitchen. What a terrific bright and functional space with lots of counter space, a view of the river (of course), pantry and more. The guest bedroom is also very comfortable with its own en suite bathroom and even a mini bar sink. There is also a separate walk-in storage closet and spacious laundry room on this side of the home as well. Additionally, there is an open art studio room with a utility sink and its own side entrance with Queen bed. ALOHA! Architect-designed home, overlooking the Wailuku River. Every space is filled with interesting angles, views and light...and STUNNING views of the river. Enjoy the incredible view from the spacious deck and watch the different moods of the river and the rain forest surrounding you. This home is incredibly private and exceptionally designed for comfort and style, all in one. The master suite is separated on one end of the home featuring a large office and resting area, and a spacious, master bathroom suite, complete with walk-in shower, and Japanese Furo bath room, both overlooking the river. The living room is very spacious with soaring, exposed beam ceilings and open to the kitchen. What a terrific bright and functional space with lots of counter space, a view of the river (of course), pantry and more. The guest bedroom is also very comfortable with its own en suite bathroom and even a mini bar sink. There is also a separate walk-in storage closet and spacious laundry room on this side of the home as well. Additionally, there is an open art studio room with a utility sink and its own side entrance. Hardwood floors run throughout this home, tying in nicely to the cedar exposed beam ceilings above. Located just a couple short minutes from downtown, this location is one of Hilo's premier neighborhoods.... with an exceptional house to do the location, and site overlooking Wailuku River. Reeds Island - - - Located just a couple short minutes from downtown, this location is one of Hilo's premier neighborhoods....with an exceptional house to do the location, and site overlooking Wailuku River. 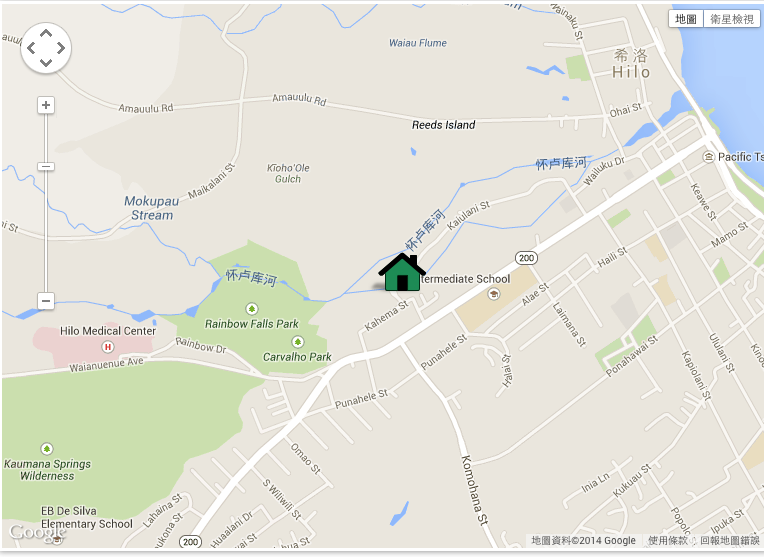 Within a short 10-15 minute walk you are in downtown Hilo with access to buses, shops and restaurants. The house is located along a river. The porch is fenced in but there are areas that are not. If you are traveling with young children, we welcome children but we want to make you aware of this.